ABSTRACT: Management of pouch colon (congenital short colon) with anorectal malformation is still very controversial. This series of 98 cases of congenital pouch colon managed during the period of 1984 to 1995 at our centre wound be the largest series published so far. Salient features regarding its incidence, distribution of types, etiological hypothesis and prognosis have been discussed with review of literature. Based on the out come of surgery, a proper management protocol has also been derived. ABSTRACT: The results of treatment have been analyzed in 367 consecutive cases of esophageal atresia (EA) with or without tracheo-esophageal fistula (TEF) over a period of 16 years (1976-1991) with respect to type of anomaly, Waterston's groups, gestational age, age at admission, weight, temperature and pneumonitis. Details of outcome were not available in 26 patients between 1976 and 979; the results of treatment have been analyzed in 341 cases after 1980. Ninety per cent of the patients had EA with distal TEF. Survival was directly related to Waterston's group, gestational age, weight, temperature and absence of pneumonitis. None of the babies with core temperature less than 35 degree C survived. Survival was not determined by age at admission. Despite improved survival rates in recent years, the overall survival does not compare favourably with those reported from developed countries. The factors resulting in poorer results have been analyzed and remedial measures suggested. ABSTRACT: 52 patients with Portal Hypertension were treated by Distal Splenorenal Shunt (DSRS) (15 percent) convential shunts (33 percent) and by nonshunt surgical procedures (52 percent). The results of the various procedures were compared retrospectively. Our experience suggests that DSRS, whenever, technically feasible should be preferred to the conventional shunts. ABSTRACT: In this prospective study, routine bronchoscopy was performed in 26 newborn babies with esophageal atresia and tracheo-esophageal fistula (EA & TEF) prior to thoracotomy for repair and the results were compared to 25 babies where repair was done without prior bronchoscopy. Pre-operative bronchoscopy. Pre-operative bronchoscopy provided significant information and reduced the postoperative pulmonary complications but did not alter the survival retes in EA & TEF. ABSTRACT: During an 11-year study period at the All India Institute of Medical Sciences, New Delhi, 'H'-type tracheo-esophageal fistula was diagnosed in 10 patients representing approximately 2 percent of all babies seen with esophageal atresia and/or tracheo-esophageal fistula. The average age at presentation in this group was higher (2 months) than the common variety (2-3 days). Delay in diagnosis primarily stems from poor sensitivity of radiological studies. Once the diagnosis is made thee treatment is straightforward. Bronchoscopic localization and cannulation of the fistula, just before definite surgery was possible in all the cases and is strongly recommended. ABSTRACT: Intestinal obstruction in infants carries high mortality and morbidity. One of the reasons of which may be due o immature immune structure and response. 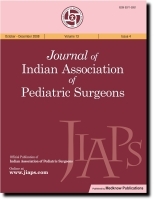 To evaluate the immune profile and C3 level in intestinal obstruction, 150 infants upto 1 year of age had been studied along with 60 age matched control cases. Serum IgG, IgA, IgM. C3 and Secretary IgA from gastric aspirate were estimated. The values were observed and its significance in different groups were discussed. The serum IgG level was significantly lower, while serum IgM, IgA and secretary IgA were significantly higher in diseased group suggesting on increased early immune response and increased local gut immunity in these patients. ABSTRACT: Two hundred patients of esophageal atresia with or without tracheo-esophageal fistula treated during a period of 8 years were studied with emphasis on magnitude of gap between two wnds of esophagus. Patients were divided in two groups, one group (154 patients) with gap less than 2 cm and other group (46 patients) with gap more than 2 cm. Mortality and complications were noted with reference to distance between the two ends of esophagus. There was high morbidity and mortality in patients with long gap. Surgical technique, proper mobilization of proximal pouch and tension free anastomosis are prerequisite for a final outcome. ABSTRACT: Posterior vertical lumbotomy approach was used for 38 operations in 31 patients for upper tract urological surgery. The approach was found to be easy, quick with minimal tissue cutting and consequently with significantly less postoperative morbidity. ABSTRACT: This paper addresses one of the most important problems confronted by the surgeon called upon to manage esophageal atresia, namely when this is associated with a long gap between the two esophageal segments. In recent times, there have been many articles devoted to the management of this potentially difficult problem, with many differences in opinion emerging including disagreement as to its precise definition. To avoid repetition, reference is made to earlier publications on this subject , based upon experience at the Royal Children's Hospital, Melbourne (1-3). Although there are various definitions, our current view is that the use of the term, 'long gap' should be limited to esophageal atresia with or without a proximal fistula-particularly the latter. It is not considered to be a suitable term for those patients with esophageal atresia with a distal fistula, with a significant gap between the esophageal segments. Regardless of the definition, it has become clear there are several options for the management of the long gap. This is not surprising, and is in keeping with the philosophy expressed in a recent Editorial (4), that this is the era of options-it is no longer possible to consider there is only one way to approach a specific problem. ABSTRACT: A six month old child developed a rupture of his left diaphragm as a result of fall from the arms of his sister. The resulting herniation of bowel into the chest caused partial strangulation of the bowel. Early operation resulted in a successful outcome. ABSTRACT: Congenital non-parasitic splenic cysts are rare. Differentiation of true cysts with epithelial lining of the cyst wall from pseudocysts without such lining is important from the management point of view. True cysts are resistant to non surgical methods of treatment like aspiration or sclerosis. Presented is the case of a 16 year old boy with an epidermoid cyst of the spleen which failed to respond to repeated aspirations and recurred following laparoscopic deroofing. This was effectively managed with surgical near total excision and omentopexy of the residual cavity. ABSTRACT: Neonatal urethral obstruction and hydronephrosis due to congenital bladder diverticulum is extremely rare. We present the case of a newborn with a large bladder diverticulum causing urethral obstruction and left hydronephrosis. The condition was suspected initially by antenatal ultrasound scan and was confirmed by postnatal voiding cystourethrography. The case was successfully managed by bladder diverticulectomy and ipsilateral ureteric reimplantation. ABSTRACT: Pre-and postoperative cortisol levels were measured in clotted blood of 27 neonates who underwent surgery for esophageal atresia with or without tracheo-esophageal fistula. The pre-operative and 6 hours postoperative values were 40.6 plus minues 29.0 and 41.5 plus minues 33.0 meug/dl respectively (p-value-not significant). These values were further analyzed with regard to various clinical and biochemical parameters. The results indicated that factors which did not significantly affect the postoperative cortisol response included age, color, temperature, weight, pneumonitis, respiratory distress, hemoglobin, blood sugar, duration of surgery, sedation, anaesthetic complications, starvation and ventilatory support. The changes with regard to blood transfusion requirements were almost significant (p less than 0.06) while the amount of blood loss was directly proportional to increase in the cortisol response (p less than 0.02). ABSTRACT: Double prolapse of bowel loops through the umbilicus is a rare complication of patent vitello intestinal duct and it has a typical clinical presentation. A similar presentation was seen in a baby who had developed this complication in a sigmoid colon fistula within a few days after birth. Possibly the fistula was iatrogenic, which occured due to umbilical cord ligature with inadvertant inclusion of an occult omphalocele containing the involved gut as its content. ABSTRACT: Eighty neonates with esophageal atresia and tracheo-esophageal fistula underwent end-to-end esophageal anastomosis. of these, 15 (18.75 percent) developed anastomotic leakage; all but one had 'major' leaks. Patients with major leaks (n=14) developed respiratory distress with saliva or gastric juice in chest drain within one week of surgery. Only one of these was taken up for re-thoracotomy, others had repositioning of drains and some had extra tubes inserted. Only 2 out of 13 survived the catastrophe. One neonate had a minor radiological leak only and was successfully managed conservatively. Of the various risk factors studied, use of braided silk suture, and distance between esophageal pouches were found to be statistically significant. Livaditi's myotomy was associated with high leak rate, possibly because of learning phase. Retropleural approach was found to have no advantage over transpleural, once a major leak had occurred. We conclude that anastomotic leak following esophageal repair still has high morbidity and mortality and an aggressive surgical intervention is needed for improved outcome.